Middlesbrough has now been officially endorsed as a One Planet Living Council, and is now committed to year-on-year reductions in CO2 emissions from their own buildings, residential dwellings and other non-council buildings. They aim to achieve this through supporting projects that help individuals, local community groups and companies adopt a trajectory towards zero carbon. 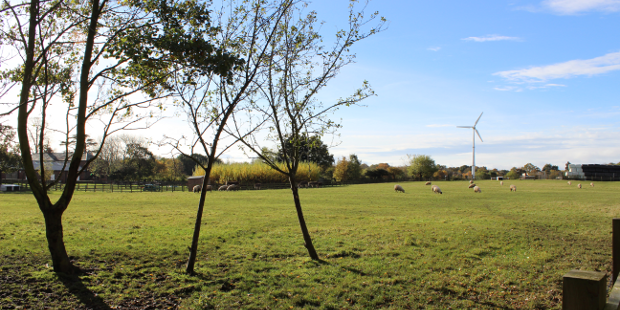 Newham Grange Leisure Farm has been a working farm since the 17th century; the 12 hectare site is now also a popular visitor attraction for schools, families and community groups. The site is without a mains gas supply and relies on electric storage heaters for space heating. Annual electricity consumption for the site is c.64MWhe. The project aimed to raise the profile of renewable energy within the Borough, while at the same time generate an income from the Feed-In-Tariff and mitigate against future electricity price rises. All of which would help safeguard the future of the Leisure Farm. Middlesbrough Borough Council approached Narec Distributed Energy to carry out the initial feasibility study for small scale wind at the Leisure Farm. Subsequently Narec Distributed Energy also carried out the design & access statement for the project, as well of providing general planning support throughout the consultation process. This included attending public meetings and producing photomontages. The project is expected to pay for itself during year 5, leaving 15 years of >£8,000 annual profit for the Council. The turbine has been forecasted to generate 24,936kWh per annum, equating to 13.1 tonnes of carbon, using the most recent grid rolling average from Defra (0.52462kg CO2/kWh). “… [it’s a] fantastic opportunity to raise the profile of renewable energy, counter the expected rises in electricity prices and add to educational programmes”. “It is a long-term investment for the farm and anything that will bring in money is welcomed”.